Some of my most precious moments have also been my hardest, because it was then that I felt God’s love and embrace most strongly. When, curled into the corner of the couch, Bible opened on my lap, and He spoke tenderly to me, words of encouragement, of strength, of blessing–of victory. In so many ways, on countless days, God has shown me what my sweet friend Shannon expresses through her inspiring post this morning. But first, I wanted to share some things I’ve discovered about Shannon. First and foremost, she loves Jesus with every fiber of her being. She and I have been critique partners for a few years now, and I’ve learned so much, on a spiritual level, simply by interacting with her. I’ve been blessed by her continual encouragement and selflessness, by her frequent prayers, and her perseverance to do all she can to show the love, power, and truth of the gospel. This sweet woman continually gives of herself. It’s not surprising to me, then, that there are times she feels depleted. In the following devotion, she shares how she replenishes. Or should I say, how God replenishes her. So I was low in spirit. On the verge of getting our taxes done for the year, I was terrified of what we might owe. Add to that, a church issue everyone is ignoring. A deadline. A leaky roof. A dead air conditioner. I’d taken the day off from a church yardsale–fundraiser for Samaritan’s purse–to attend a writers meeting. I was feeling guilty about it even though I’d helped organize the sale and worked it the day before. Though I was interested in the topic being taught that day, I made a point to go because writer’s meetings always inspire me and lift my spirits. A room full of like-minded believers uplifting Jesus with their words. What could be better? In it, they sing about crying out for God and not receiving a reply, of not being able to feel God by their side and choosing, in that moment, to hold on to what they know to be true–that God is always there. And boom, God reminded me that I’m never alone. I don’t pretend to be a martyr, and none of my troubles measure up to a tiny iota martyrs have faced. But living in this world often makes me feel like one and I never listen to that song without getting teary-eyed. By the time I got to the meeting, my spirit was soaring. And it only got better as the day progressed. My writer friends made me laugh, helped me remember why I write, and reminded me to count my blessings. What do you do when your spirits need a boost? Do you have a favorite song that reminds you of what is important? She hopes to entertain Christian women and plant seeds in the non-believer’s heart as her characters struggle with real-life issues. Their journeys, from ordinary lives to extraordinary romance through Christ-centered relationships, demonstrate that love doesn’t conquer all—Jesus does. In her spare time, she loves hanging out with her family, flea marketing, and doing craft projects. Visit her online at her website, on her blog, connect with her on Facebook and Goodreads, and follow her on Pinterest and Twitter. Share your thoughts, examples, and experiences with us. Can you remember a time when you were feeling down about something and you sensed God speaking to you? When do you tend to feel closest to God? Share your thoughts with us in the comments below, because we can all encourage one another! Whatever we focus on tends to dominate our thoughts, and our thoughts determine our emotions. Is it any wonder then that our misery grows when we obsess over the issue or difficulty? And yet, when we choose to praise … Today my sweet friend, photographer, and gifted devotional writer, Susan Aken shares some thoughts on how we can choose to praise God, no matter our circumstances, and why we must. “My heart is steadfast, O God! I will sing and make melody with all my being! Awake, O harp and lyre! I will awake the dawn! I will give thanks to you, O LORD, among the peoples; I will sing praises to you among the nations. For your faithfulness reaches to the clouds” (Psalm 108:1-4 ESV). I WILL give thanks to You, O LORD! David determined to sing for God with all his being. He chose to start his day praising God. He made the choice to give thanks to Him. He was set on praising God in his heart and also chose to praise Him among the nations. Why? Why would he praise Him in spite of trouble and oppression? Why would he praise Him in spite of his own weaknesses? Why would he praise Him in the midst of daily struggles? Why would he praise Him? Because God’s love is great above the heavens! His love never fails. His love is everlasting! Because His faithfulness goes on forever! He deserves all praise and all glory! His love and faithfulness will never fail us. I will sing and make melody with all my heart! I will wake up in the morning praising Him! I will sing your praises to those around me. It’s a choice I can make. I can praise Him in spite of circumstances because He never changes. His character is firm in spite of my problems and struggles. I can praise Him because His love for me never fails. He will never love me any less. I can make the choice to sing and make music in my heart. I can thank Him everyday for all He does for me. I can also choose to praise His name to those around me. I can tell them how great He is. God’s love for me is steadfast. It will never change. His faithfulness goes on forever. He is worthy of all my praise. I will give thanks to you, O LORD! I will sing your praises to others. Praise your Holy Name! This is a choice we can make every day! It’s a gift we give to our Lord. Let’s talk about this! Choosing to praise isn’t always easy, but man, is it important. It draws our hearts closer to Christ and helps us appreciate all the abundant blessings He’s provided. When life is going well, it’s easy to praise. But when life is hard, what can we do to really fix our thoughts on Christ and praising Him, remaining steadfast in our praise? Share your thoughts and experiences with us in the comments below, because we can all learn from each other. 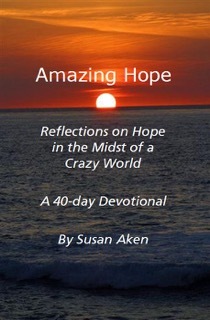 And be sure to check out her wonderful devotional! Also, if you’re in the Omaha/Bellevue/Papillion area, I’d love to see you Saturday! Stop in at Divine Truth Christian bookstore and grab an autographed copy of my latest release, Restoring Love! Reviewers are calling this my best novel yet, and I’ve been told it’d make a great witnessing tool. Plus, it’s set in Omaha, which is crazy fun! For years, I spiraled into self-destruction, ultimately ending up homeless. Well before my eighteenth birthday. I don’t know the statistics, but I do know the probability of one climbing out of that mess aren’t high. These were my thoughts as I read June Foster’s devotion the other day, because I do believe, that afternoon when sweet Dorothy shared the gospel, and when God grabbed hold of my heart, He marked me as His, pursuing me, wooing me, and surrounding me with His healing, restorative, life-transforming love. A rewarding way to study the Bible is to select a few verses of scripture and as a Sunday school teacher from long ago said, “eat them.” To devoir every word and see what the Lord wants me to learn. Recently I did that with Ephesians 1:13-14. I discovered something remarkable. “And you also were included in Christ when you heard the message of truth, the gospel of your salvation.” Yep. That’s me. I heard the message and after a few months of stubborn rejection, I received the truth into my own life, asking Jesus to be my Savior. But what happens when we do that? “When you believed, you were marked in him with a seal, the promised Holy Spirit, who is a deposit guaranteeing our inheritance until the redemption of those who are God’s possession—to the praise of his glory.” I could picture myself tightly gripping a deed to a house, a document that guaranteed the dwelling belonged to me. But the Holy Spirit is much more than a deed on a house or a stock certificate. He is the guarantee that proclaims our future home—an eternity with the Lord. A beautiful image formed in my mind. It was a golden cross sitting over my heart. Praise God for His deposit guaranteeing our salvation. Something we can hold onto until the day we see Him face to face. We’re hidden safe. He’s holding tight to us, in the good, the bad, the uncertain–through it all. Rest in that this morning. For those facing difficult situations, and with them, questions you can’t find answers for, I encourage you to read Julie Aruduini’s guest post on Wholly Loved: When You Do Everything Right. An award-winning author, June Foster is a retired teacher with a BA in education and MA in counseling. In 2013, June’s book Give Us This Day was a finalist in EPIC’s eBook awards and in 2014 a finalist in the National Readers Choice Awards for best first book. Ryan’s Father was one of three finalists in the published contemporary fiction category of the 2014 Oregon Christian Writers Cascade Writing Contest and Awards. Deliver Us was a finalist in COTT’s 2014 Laurel Awards. June has written four novels for Desert Breeze Publishing. The Bellewood Series, Give Us This Day, As We Forgive, and Deliver Us, and Hometown Fourth of July. Ryan’s Father is published by WhiteFire Publishing. Red and the Wolf, a modern day retelling of Little Red Riding Hood, is available from Amazon.com. The Almond Tree series, For All Eternity, Echoes From the Past, What God Knew, and Almond Street Mission are available at Amazon.com as well. Misty Hollow is published by Helping Hands Press. June enjoys writing stories about characters who overcome the circumstances in their lives by the power of God and His Word. Recently June has seen publication of Christmas at Raccoon Creek and Lavender Fields Inn. Visit June at junefoster.com. Love grows amid the flowers in the magnificent Rockies at Lavender Fields Inn, but romance can be deceptive at times. Graham Maier needs to prove to his father he’s as capable as his brother Greg. The Rocky Mountain Anglers’ Tournament at Gold Pan Lake will give him the chance. But he must win first place. After he meets Wren, a woman like the unnamed girl who’s occupied his dreams, he can’t understand why she suddenly won’t speak to him. Can Wren learn to trust men again? Can Graham understand how valuable he is in God’s sight? Have you ever felt invisible? Wondered if anyone would notice, should you stop doing whatever it is you’re doing, day in and day out? When our daughter was younger, I often wondered what would happen if I didn’t make the bed–after all, it’d only get messed up again. Or what if I left the laundry and dishes untouched. There were times, many, when the tedium of the day wore me down and left me feeling … insignificant. They say integrity is doing what you know is right when no one is watching. Except, Someone is always watching, right? Psalm 139 tells us God is attentive to our every move. He knows every detail of our lives and every thought that flits through our brain. More than that, He takes great delight in us. Psalm 37:23 says, “The Lord directs the steps of the godly. He delights in every detail of their lives. Though they stumble, they will never fall, for the Lord upholds them by the hand” (NLT, emphasis mine). Pause to consider that verse for a moment. The Lord delights in every detail of our lives–when we’re doing something grand and exciting and when we’re folding towels for the umpteenth time. Perhaps because He knows our character, that part of us He’s continually molding, is grown in the big and the small. I don’t know about you, but I want to be a woman of integrity. I want to be known for my character and obedience. I want God to look down on me, when I’m elbow deep in dishwater, and smile, and I want to do it all–everything–for Him and His glory. These emotions and thoughts were triggered as I read Luke 1:5-7. Elizabeth and Zechariah, an old and childless couple, were known for being righteous and carefully obeying God’s commands and regulations. When we read this passage, it’s easy to skip over that, probably because we know the end of the story. They were faithful, and God rewarded them with something they’d deeply longed for–a child. Not just a child, but the one birthed to proclaim the coming of Christ. But let’s step back. Back to when, still childless and likely unnoticed, John’s parents lived obediently. Scripture tells us Zechariah was a Jewish priest, and as such, his responsibilities were to maintain the workings in the temple, instruct the people, and on occasion, if the lot cast landed on him, to enter the Holy Place of the Tabernacle to burn incense on the altar of incense. I’m not a statistician, but it seems likely he could go his entire life and never, not once, receive this honor. He was one of 20,000 priests! Though Scripture doesn’t tell us, I think it’s safe to assume there were times he felt unseen and wondered if what he did mattered. After all, should he simply cease performing his duties, there were 19,999 other men ready and able to take his place, many of which likely had children. Let me explain the significance of that for a moment. In Bible times, children were seen as a blessing from God; barrenness was seen as a curse. Meaning, Elizabeth and Zechariah were likely judged for their infertility. The common assumption of their day–They’d likely done something wrong or had displeased God in some way, and that was the reason they were barren. In other words, Elizabeth and Zechariah served God faithfully in the midst of their sorrow. Despite the fact that He hadn’t granted them the one thing they likely longed for above all else. They obeyed in the mundane, in the hard and painful, simply because it was the right thing to do. They obeyed because they knew God is worthy, amen? This leads me to this week’s memory verse: “Whatever you do or say, do it as a representative of the Lord Jesus, giving thanks through Him to God the Father” (Col. 3:17 NLT). There’s a verse I love, and one I pray often: “And so, dear brothers and sisters, I plead with you to give your bodies to God because of all He has done for you. Let them be a living and holy sacrifice–the kind He will find acceptable. This is truly the way to worship Him” (Romans 12:1 NLT). In view of all God has done for us, in view of Christ’s sacrificial death so we might live, may we offer our whole bodies–all we are. Our time, our gifts, our words, our thoughts–to Christ, as a living sacrifice. Sometimes life is a sacrifice, right? Obedience isn’t always easy or glamorous. But that is “truly the way to worship [God].” Or to put it another way, every time we scrub toilets, mop floors, wipe snotty noses, or answer phones, if we’re doing it in obedience to Christ, we’re worshiping Him. For further discussion, I invite you to join Cynthia Simmons and I for a video discussion on today’s passage. What were your thoughts as you read today’s focal passage? Is there an area in your life or something you do that feels insignificant? How does it feel knowing God is watching you every time you engage in that activity? How does it feel knowing that thing, whatever it is, can be an act of worship? Did you have any other insights to share? For those wanting to learn how to dig deeper into Scripture, join me in our Facebook group where we’ll be talking about reading biblical passages in light of their historical context. We’ll also touch a little on what I encouraged you to do last week–jot down observations and any questions you might have. Scroll through social media long enough, and chances are you’ll read a few (or more) negative posts regarding Christians and Christianity. Some say we’re intolerant, others that we’re hateful, close-minded, or out of touch, or whatever. Find a negative adjective, and I’m pretty sure you can find a statement connecting it to Christ-followers. Granted, there are those among us who do indeed fit those descriptions, but from my experience, when I step back and truly consider, those angry (or perhaps confused) individuals are the minority. The vast number of Christians I know are doing amazing things. They’re feeding the hungry, adopting orphans, walking beside single moms, bringing clean water to the sick and thirsty, medical care to the ill, and more. So much more. Yesterday I considered all the ways God’s children have shown up in my life lately, of all the sacrificial giving of time and resources I’ve seen displayed, not by one, not by two or three, but by a large number of believers with whom I have contact. All this points not to the good of the human heart, nor to the quality of my friends (though I think they’re amazing) but rather to the power of the Holy Spirit, at work in us. And every act of love displayed by one of God’s children points to His ever-reaching, ever-faithful Daddy’s heart. God has called our family to something hard, amazing, beautiful, and frightening. He has called us to help initiate life change and healing, to show the truth and depth of His love, even when–especially when!–that love is spurned. This in and of itself is not unique to Christians. I believe we all as humans long to make an impact, to help others, and to see our world change. But wanting and doing are entirely different things, and on our own, in our own strength, we lack the power to truly live “all in,” sacrificially, for a significant length of time. Let me explain–from my experience. Lately, many have showered me with accolades, saying they view me as giving, loving, and … saint-like. But I’m not. So not. On my own, I’m selfish, fearful, distracted, impatient, ever-viewing the world through a me-centered lens. And that’s where the tug-push-pull comes in–an inner wrestling of God’s Spirit with mine, and an intimate time where He personally meets with me, changing my thinking, softening my heart, and empowering me to follow, wholeheartedly, His leading. Here’s how it starts. I’ll step out in love and faith, only to have my love spurned. My natural, human reaction? To get frustrated, maybe even angry, discouraged, and to want to pull back. To self-protect and withdraw–to take the easy route. But then, in the midst of my selfish thinking, God speaks gently to my heart. Sometimes He’ll remind me of His love. Always, He’ll help me see the situation and the other person through His eyes. Let me pause here. That is the most powerful, most attitude and heart changing aspect of walking in a close relationship with Christ–being granted the ability to see, truly see, other’s through Christ’s eyes–to catch a glimpse past behaviors and words to the hurting, bleeding heart within. When that happens, everything changes, in an instant. Anger is turned to compassion. Frustration to peace. Discouragement to hope. Selfishness to love. And suddenly, one is filled with a passion so strong, they cannot not act, cannot not love. This has been my journey lately, a daily teeter totter, and praise God, He has been winning–love has been winning. Not because there’s anything remotely good within me, but because God has proven strong on my behalf. Again and again and again. And through it all, I’ve grown even closer to Him as He overwhelms me with the revelation of the depth of His love for our hurting world. When I started this post, I planned to share all the ways God’s children have shown up for our family as we seek to obey Him. But as I wrote, it took a bit of a detour, hopefully one that was God directed. For those of you who do have a relationship with Christ, I challenge you (and me) to get and stay connected–to Him. Make your relationship with Christ your top priority and to carve out time when you rest in His presence, allowing Him to change your perspective, soften your heart, and empower you to do that which He has called you to do. Because in Him, you have everything you need to live the life He desires. Let’s talk about this! What is God calling you to do? In what ways has He empowered and equipped you to do that? In what ways has He revealed His love to you through others? Share your stories with us here in the comments below or on Facebook at Living by Grace, because God is worthy of our praise and the whole world needs to know about all the great things He does and has done! But before you go–an invitation to my Omaha Metro friends. Join me and my sister in Christ, singer Shelly Conn, at Chocolaterie Stam for a fun afternoon of live music, books, readings, and chocolate!